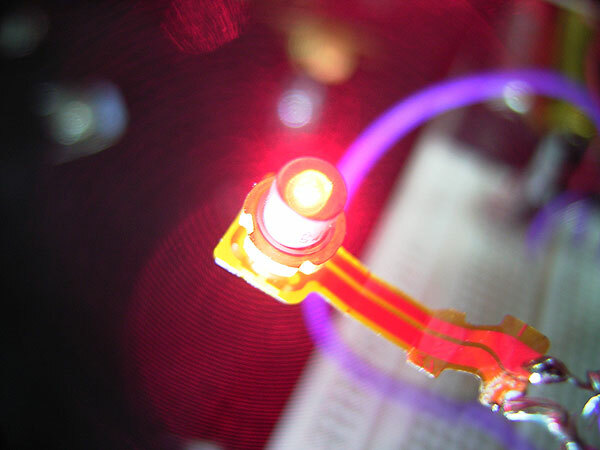 Creation of a rather power 650nm laser. 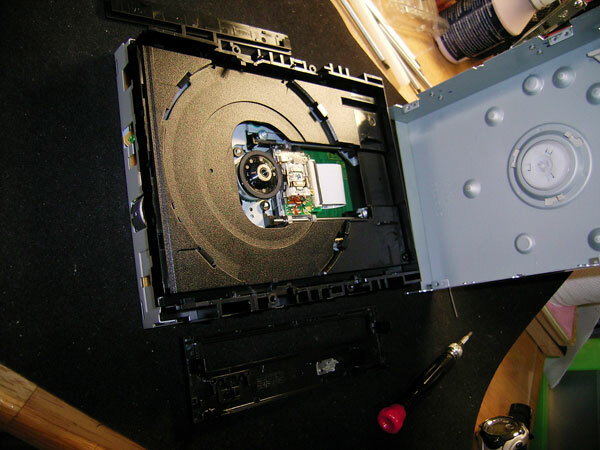 When laserdiscs first appeared in the 1980s, it was a leap forward in technology over magnetic media, though it never really got very popular (except in Japan where this optical technology was better supported). Back then, laser diodes and LED technology were in their infant stage and were still very expensive. In fact, manufacturers actually used HeNe laser tubes to read the media. It was not until 1983 when Hitachi introduced the first industrial player using a laser diode, and only in 1984 when the first consumer one was produced by Pioneer. 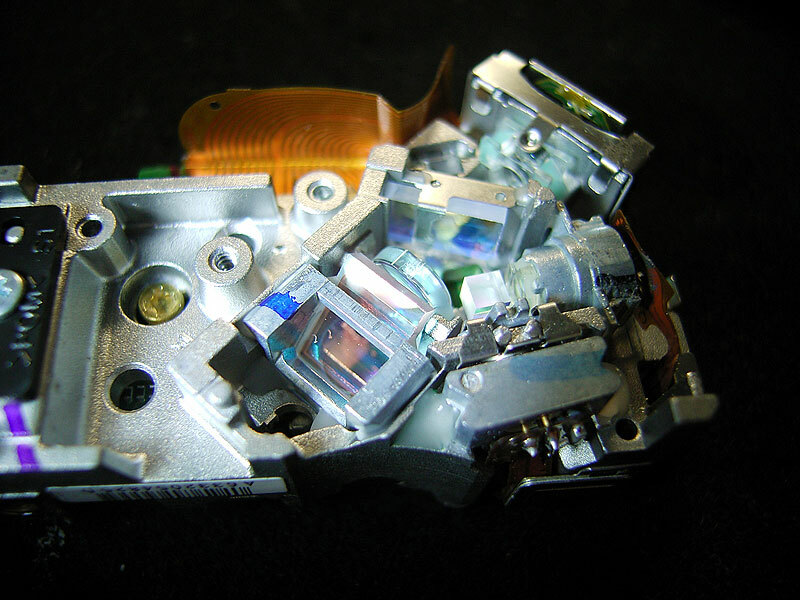 Since then, technology has evolved to the Compact Disc (using a 780nm IR laser) capable of storing 700mb, the Digital Versatile Disc (using a 650nm laser) capable of storing 4.7Gb, HD-DVD (using a 405nm laser) capable of storing 15Gb, and BD (also using a 405nm laser) capable of storing a crazy 25Gb! 2. 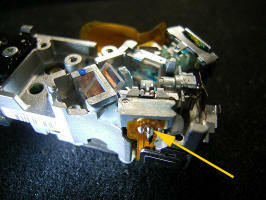 The 650nm laser a DVD uses is now Visible to the human eye (whereas 780nm is not for CDs)! 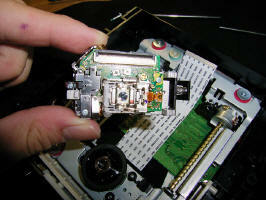 The project initially was to harvest the laser diode from any DVD drive and to power it to make laser light! But after some reading up, it was apparent that DVD writers, especially the powerful 16x ones, contained a very powerful laser diode. 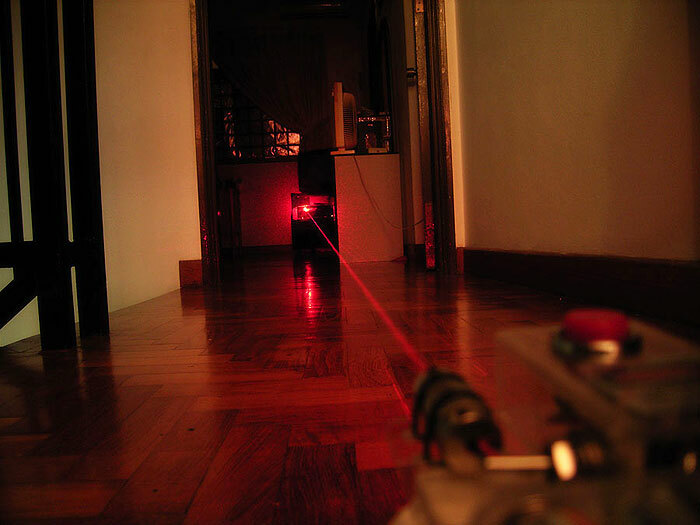 Back then, www.wickedlasers.com sold legendary laser, claming to be able to burn things and set matches on fire. And people were reporting that the diodes inside these laser were powerful enough to do just that. 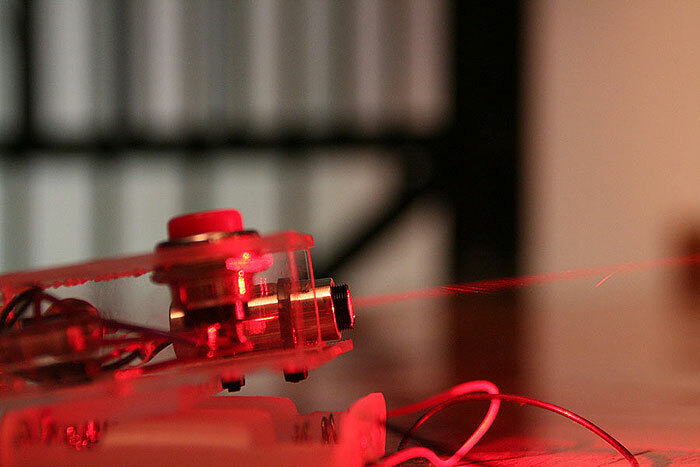 Expensive Powerful Lasers soon became within reach. Here is a brief account on my attempt at building such a laser. I walked around Sim Lim Square and eventually found this nice 16x Pioneer DVD burner for SGD$45. Not too cheap but it was the cheapest 16x I could find. The high ratings should mean that the diode inside will be reasonably powerful. 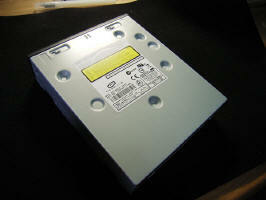 People have reported 150mW - 200mW from diodes in similar drives! So my hopes were high. The first step was to open up the main cover and get all the unwanted bits away. It's a bit sad to have to spoil a completely new drive, but we have to make sacrifices sometimes, for Science! 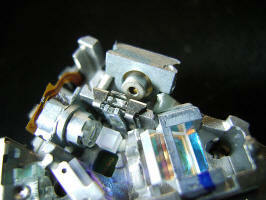 After a bit of twiddling around, the laser module is easily extracted. The hard part comes now. After unscrewing the metal plate covering the optics, it is clear that there are 2 diodes. 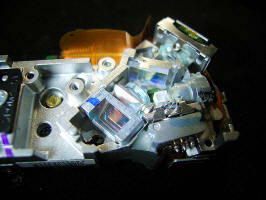 One 780nm diode for reading/writing CDs, and one powerful 650nm diode for reading/writing DVDs. We just need to find it! 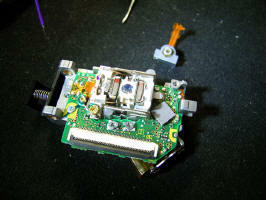 The two diodes are at the sides of the assembly, so they are easy to spot. To differentiate them, we need to apply power to the diodes. This is were Many people make the fatal mistake and fry their diode! 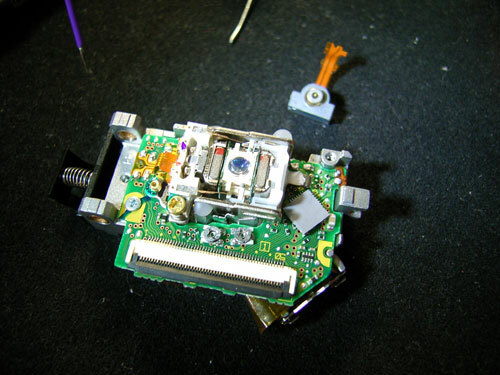 DO NOT connect a 3V (2x AA) batteries DIRECTLY to the laser diode. 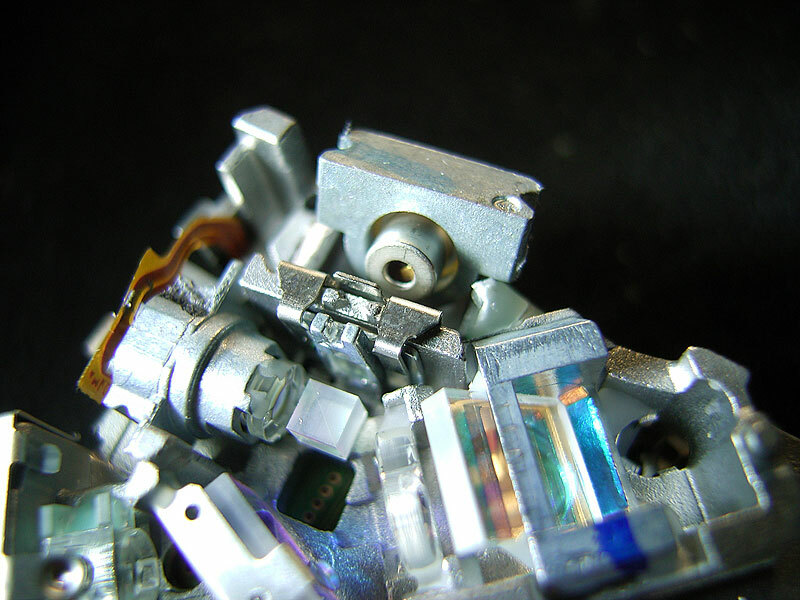 Laser diodes are very current sensitive devices, and your batteries can produce far too much current than the diode can handle, and they will fry if their maximum current is exceeded (easily). Read my more comprehensive Project 405 page (scroll to the part on the driver circuit) for more details! The wise thing to do is to setup a current-regulated circuit first, then use it to test the diodes. 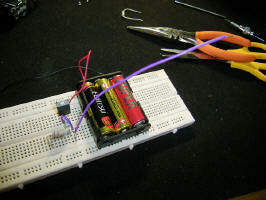 You don't need a fancy circuit; a simple one is sufficient. So I fixed up one on a breadboard (read more about the circuit below) and quickly found the diode. The case of the diode is often connected to the ground pin, and since the case of the diode is stuck into the entire assembly, testing is nothing more than connecting the negative end to the entire laser module, and testing each diode pin with the positive end. I've found the diode (marked with an orange arrow) above, and as you can see, it's press fitted into it's own little heat sink. We need to get the bare diode out. The diode is very fragile, so great care was taken to ensure I got it out safely. I used a rotary tool and grinded a little grove at the thickest part of the heat sink (you can use a small saw also), then using 2 pliers, twisted the metal bracket. The bracket broke easily and the diode came out safe and sound! One more photo showing the extracted diode running great! 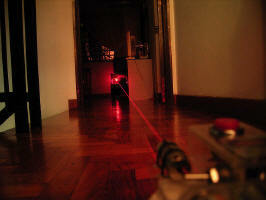 The laser diode runs at about 3V. But the driver circuit will cause a bit of a voltage drop so I opted to use 4x AA batteries for a 6V input source, fed into a simple LM317 current regulator circuit with a 4.2 Ohm resistor. While people have reported driving the diode at 350mA, I decided to run it at 298mA instead for a longer diode lifetime. Should still be pretty bright! Once the driver was done, I set it up and tested the diode as above. Works like a charm! 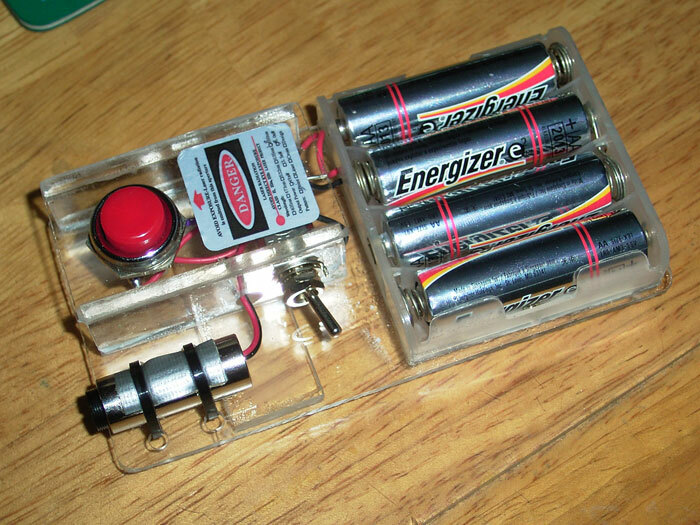 Completed built with clear acrylic and has two switches - one momentary, one constant. 4 AA batteries provide extra-long running time!